The Tickle Giggle Experience, a short programme of exciting, dynamic and innovative interactive play sessions for parents and new babies. Many parents, after the initial intense emotion of the birth and bringing baby home, face the "What do we do now?" feeling. Play can make a positive and significant contribution in helping parents give their child the best possible start in life. It can also be a release from the 'care and routine' pressures. Through sharing songs, rhymes and simple games we bring out the fun and adventure in parenting while highlighting many development and learning benefits. Having spent nine months choosing names, prams and car seats, it's now time to consider shaping the personality and learning journey of baby. 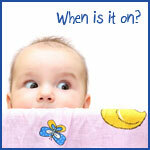 Tickle Giggle Bump is for expectant parents; Tickle Giggle Baby for parents and babies up to one year. The philosophy is simple :"share the play; share the learning; share the fun"
© 2011 Tickle Giggle Ltd. Tickle Giggle, Room 31, Hydepark Business Centre, 60 Mollinsburn Street, Glasgow G21 4SF. Tel : 0141 558 5440.